Sorry, this hot coupon is no longer available. 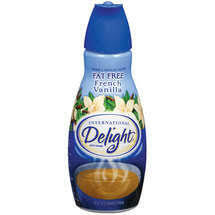 A great coupon to Save $1 on any International Delight Coffee Creamer (16 oz or 32 oz). Walmart has a great price on this product – if you happen to know what it is please share it in the comments! I know it will vary slightly by region, but it seems like I’ve used this coupon at Walmart in the past for a great deal even when it’s regular price. Remember you can print this coupon twice. I live in the Chicago area and found the smaller bottle for $1.19!!!! I live in Missouri and our biggest bottle is 2.92 at walmart. I even bought some yesterday and had i known about this coupon sooner i would've printed it off. Our Target store had them on sale for $1.15, so only $.15 after coupon. Oooh… I was JUST looking at this stuff at Walmart today! I know that the biggest bottle was definitely under $2, and there was a smaller bottle that was much cheaper. Yummm-o! LOVE this coupons this coupons reissues every time my old one expires and when I use it at stores that double, WHOOOO my favorite creamer for around $.30, am I a happy coffee drinker now.